Your GE 2.6 cu. ft. Front Load Washer in White features a PerfectTemp wash system with a HydroHeater that increases the wash temperature to reduce bacteria for a thorough clean. HydroMotion technology gently removes soils from garments to limit wear and tear on your clothes. Stainless Steel wash basket resists rust and won't snag clothes. Make short work of laundry duty with the GE ENERGY STAR 4.9 cu. ft. high-efficiency top load washer. The large capacity can easily handle bulky loads and family-size laundry demands, while 13 different cycles give you the power to tackle a full range of fabrics and soil levels. Launder clothes with this 5.8 cu. ft. capacity GE washer. Its auto soak feature loosens tough stains before the main wash to maximize cleanliness, and the deep rinse removes residual detergent and fabric softener, so your clothes last longer. This GE capacity washer has a soft-close glass lid to prevent slamming. Wifi Connected laundry functions from your smart device. 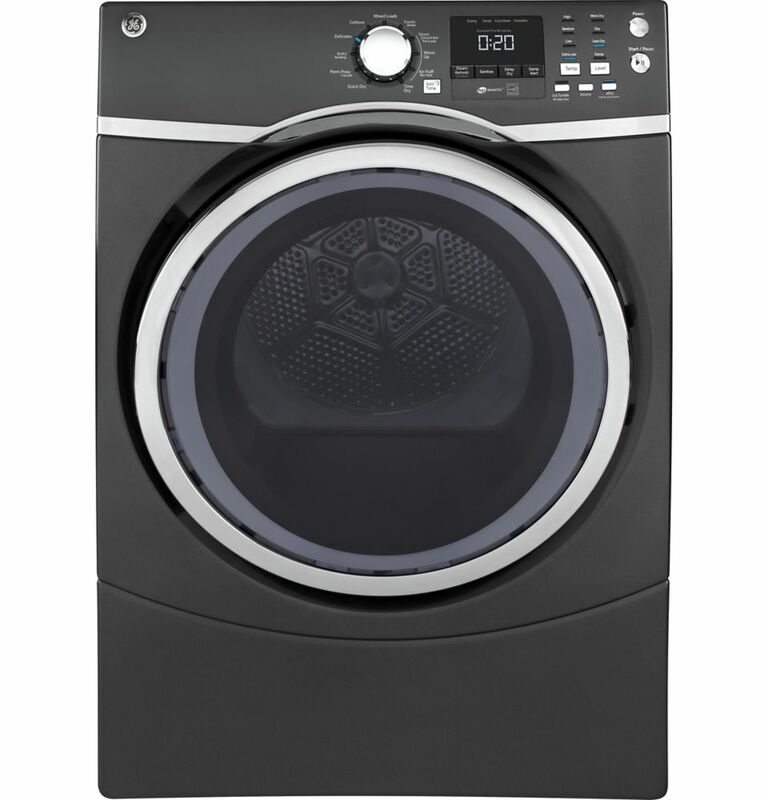 7.5 cu.ft capacity frontload electric dryer - diamond grey - ENERGY STAR® Care for clothing quickly with this 7.5 cu. ft. GE front load electric dryer. Ten drying cycles and four heat levels let you tailor settings to specific fabrics, and internal sensors automatically adapt the cycle to the moisture level inside the stainless steel drum. This 27-inch GE front load electric dryer has steam settings for fast wrinkle removal.